The best way to cook meatballs is the classic Italian way of cooking meatballs. The Italian version of meatballs features a combination of ground beef, veal and pork as the base of the meatball. It is seasoned with traditional Italian spices and seasonings like garlic, oregano, basil and parsley. 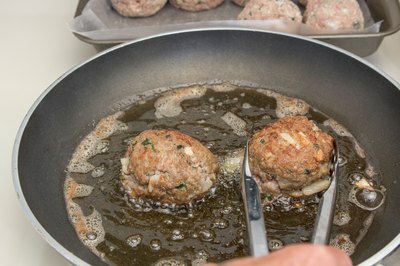 This style of meatball is usually about a quarter-cup portion, formed into a round ball and fried in olive oil before being roasted in an oven. Frying the meatball in advance ensures a flavorful crust of the meatball and a juicy interior. In a large bowl, combine a cup of ground beef, a cup of ground veal and a cup of ground pork. Many times supermarkets will provide a combination package all ready for you to use. Add into the large bowl two eggs, a half cup of grated Parmesan cheese, a tablespoon of dried oregano, a tablespoon of dried basil, a teaspoon of fresh chopped parsley, a teaspoon of minced garlic, a tablespoon of grated onion, a teaspoon of kosher salt and a half teaspoon of fresh ground pepper. In a separate bowl, mix a half cup of whole milk with two cups of fresh white bread. Let the bread soak up the milk. This may take up to five minutes for all the bread to get soaked. Squeeze the milk out of the bread and add the soaked bread into the meat mixture. Wash your hands thoroughly, and start to gently combine the meat mixture with the bread mixture. Take a quarter-cup scoop or an ice cream scoop, scoop a portion of the meat mixture, and place the formed ball onto a cookie sheet. Continue forming balls until you are out of meat mixture. Heat a half cup of olive oil in a large saute pan on medium high heat. The oil is ready when you sprinkle a drop of water and it sizzles in the oil. Drop the meatballs into the hot oil one at a time. Allow at least one to two inches between each meatball, so the oil temperature does not decrease too much. If you overcrowd the pan, the oil will become too cool and will soak into the meatballs. Fry each meatball on each side until browned. Placed finished meatballs on a cookie sheet. Once you have fried all the raw meat mixture, bake the fried meatballs in an oven preheated to 375 degrees Fahrenheit. The meatballs will need about 15 minutes to cook. To make sure they are completely cooked, insert a meat thermometer and make sure the temperature reads 155 degrees or higher. Remove the meatballs from the oven. Either toss the meatballs into a marinara sauce or serve on their own with buttered noodles with fresh Parmesan grated on top. Nothing says comfort food like classic meatballs and spaghetti. Learn how to make savory, flavorful meatballs with this recipe. How to Make Homemade Meatballs - the best ever!